The thoughts of a dad and small town doctor. When Walter Deever of Houtzdale, PA checked in for his flight last week out of Pittsburgh International Airport, he never expected to have his life saved. Ask him today, and he'll tell you that's exactly what happened. Thanks to the new enhanced pat-downs being enforced by the TSA, he may very well have averted a personal crisis. This is not an isolated incident either. Gladys McFadden of Sugar City, ID learned of an abnormal breast mass on November 13th, while receiving her pat down. “I was so relieved,” said the 67 year old McFadden. “It has been several years since I had been in to see my doctor for my routine health screening. 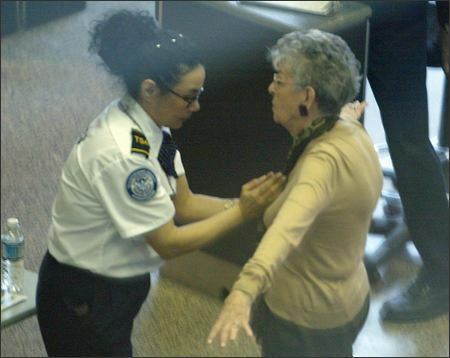 I'm glad to know that the TSA is looking out for me.” In fact, McFadden has become close friends with TSA agent Shirley Atterbury since the incident, and Atterbury plans on visiting her in the hospital next week, after her mastectomy. While both HHS and TSA officials are very pleased with the early results, most will admit that such early success has been more luck than science. “We are very proud of our agents who have taken the initiative so far, but I believe the real impressive numbers will begin to be seen sometime next summer, after we begin our Cancer Screening for Law Enforcement classes”, commented Pistole. Beginning spring of 2011, all TSA agents will be required to complete the 3-day course put together by the United States Preventative Services Task Force. “By year’s end, we hope to be providing complete breast and testicular cancer screening in all airports and have at least 50% of facilities capable of providing skin and prostate cancer screening as well.” By 2014 it is hoped that all of these services as well as pap smears and colon cancer screening with flexible sigmoidoscopy will be provided routinely at all airports. Depending on the success of the program, the TSA may be expanded to provide services at subway and train stations as well as sporting events, theme parks and concerts. I would love to hear your thought and responses. Please take a moment to comment. Matthew McConaughey: Man of God? "I don't want to go to Bethlehem"
Like this post, please share!